Torrey House Press, 9781937226411, 240pp.
" Terry and Brooke]'s quest to understand Jefferies' ideas of a 'soul-life' has brought the British writer's ideas alive..."
..".an oustanding new book...a first-rate tribute to an author who now has been rescued from obscurity." ..".a small volume that packs a punch." "The couple converses with Jefferies in the book as if with a new friend...Jefferies' prescient call for solitude in nature has proven itself worth fresh consideration." "What makes The Story of My Heart such an enjoyable find is the context that Terry and Brooke provide with their own commentary." "The Williamses anchor Jefferies' profound inquiry to our churning world and illuminate their own passionate quests for truth and understanding." "Brooke and Terry give a sense of cohesion to Jefferies's writing, and leave readers with much to ponder about our own chaotic, fast-paced, work-obsessed world." While browsing a Stonington, Maine, bookstore, Brooke Williams and Terry Tempest Williams discovered a rare copy of an exquisite autobiography by nineteenth-century British nature writer Richard Jefferies, who develops his understanding of a "soul-life" while wandering the wild countryside of Wiltshire, England. Brooke and Terry, like John Fowles, Henry Miller, and Rachel Carson before, were inspired by the prescient words of this visionary writer, who describes ineffable feelings of being at one with nature. 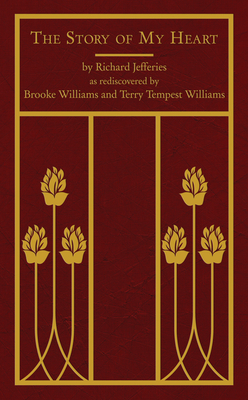 In an introduction and essays set alongside Jefferies' writing, the Williams share their personal pilgrimage to Wiltshire to understand this man of "cosmic consciousness" and how their exploration of Jefferies deepened their own relationship while illuminating dilemmas of modernity, the intrinsic need for wildness, and what it means to be human in the twenty-first century. Terry Tempest Williams is the author of fourteen books including Refuge: An Unnatural History of Family and Place and When Women Were Birds. Recipient of numerous fellowships and awards, she teaches at Dartmouth and the University of Utah where she is the Annie Clark Tanner scholar in the environmental humanities graduate program. Her work has been anthologized and translated worldwide. Brooke Williams has spent thirty years advocating for wildness, most recently with the Southern Utah Wilderness Alliance and as executive director of the Murie Center in Moose, Wyoming. He is the author of four books including Halflives: Reconciling Work and Wildness, and dozens of articles. Brooke and Terry have been married since 1975. They live with their dogs in Jackson, Wyoming, and Castle Valley, Utah. John Richard Jefferies (6 November 1848 - 14 August 1887) was a British novelist and essayist who helped pioneer the field of modern nature writing. Jefferies described the English countryside with an intimate vividness and expansive passion that inspired both his contemporaries and later writers. Terry Tempest Williams is the author of fourteen books including Refuge: An Unnatural History of Family and Place, and most recently, When Women Were Birds. Recipient of John Simon Guggenheim and Lannan Literary Fellowships in creative nonfiction, she is the Annie Clark Tanner scholar in the Environmental Humanities Graduate Program at the University of Utah. Her work has been anthologized and translated world-wide. Brooke Williams has spent thirty years advocating for wildness, most recently with the Southern Utah Wilderness Alliance and as the Executive Director of the Murie Center in Moose, Wyoming. He holds an MBA in Sustainable Business from the Bainbridge Graduate Institute and a Biology degree from the University of Utah. He's written four books including Halflives: Reconciling Work and Wildness, and dozens of articles. He is involved in The Great West Institute, a think tank exploring expansion and innovation in the conservation movement and is currently working on a book about ground-truthing. Brooke and Terry have been married since 1975. They live with their dogs in Jackson, Wyoming, and Castle Valley, Utah. Scott Slovic is professor of literature and environment and chair of the Department of English at the University of Idaho. He served as founding president of the Association for the Study of Literature and Environment from 1992 to 1995, and since 1995 has edited ISLE: Interdisciplinary Studies in Literature and Environment. The author of more than 200 articles in the field of ecocriticism, he has also written, edited, and co-edited twenty-one books, including Seeking Awareness in American Nature Writing and Going Away to Think.